AN Aberdeenshire farm shop is encouraging its customer to refresh their morning routine and take the time to have a healthy breakfast each morning. The Store, in Foveran, near Ellon, which has its own farm and butchery on-site, is supporting farmhouse breakfast week (26 Jan to 1 Feb), managed by the Home Grown Cereals Authority (HGCA), for the tenth year running, in a bid to remind people how important it is to have a healthy breakfast. Alarmingly, one in four consumers are still missing out on breakfast, but the morning meal is vital, as your body and brain requires the nutrients and energy to get through the day. The award-winning family run farm shop, which follows a farm to fork approach, has an on-site butchery, which gives them 100 per cent traceability and control on all their products and meat produce. The Store’s daily menu and shop sells it own hand-reared produce, so the farm shop can be sure that the breakfast’s products on offer are fresh, local and natural. The Store managing director and farmer, Andrew Booth, said: “With 47 per cent people regularly skipping breakfast during the week, we really want to remind people how important this meal is. “Without breakfast, people tend to have lower energy and concentration levels, which is not good for children at school or adults at work. The farm shop, which was launched in 2000, is only ten minutes from Aberdeen and will be running a special breakfast menu every day from Saturday 25 January until Sunday 2 February. The Store is open seven days a week, from 10am-5pm. 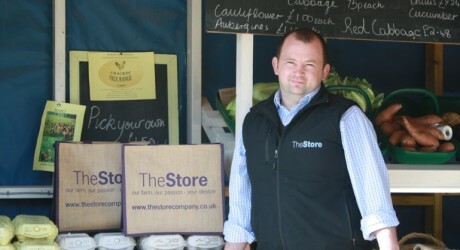 To find out more about The Store contact 01358 788083 or visit www.thestorecompany.co.uk.